I haven’t made any jewellery in so long, it was nice to dust off my round nosed pliers and my wire bits and bobs! 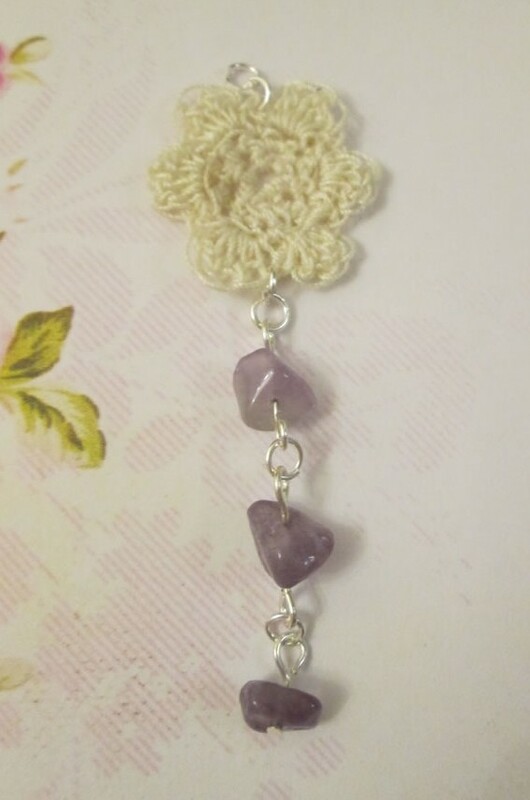 I’ve incorporated crochet into jewellery making before. You can read about it here:Crocheted Wire Earrings. 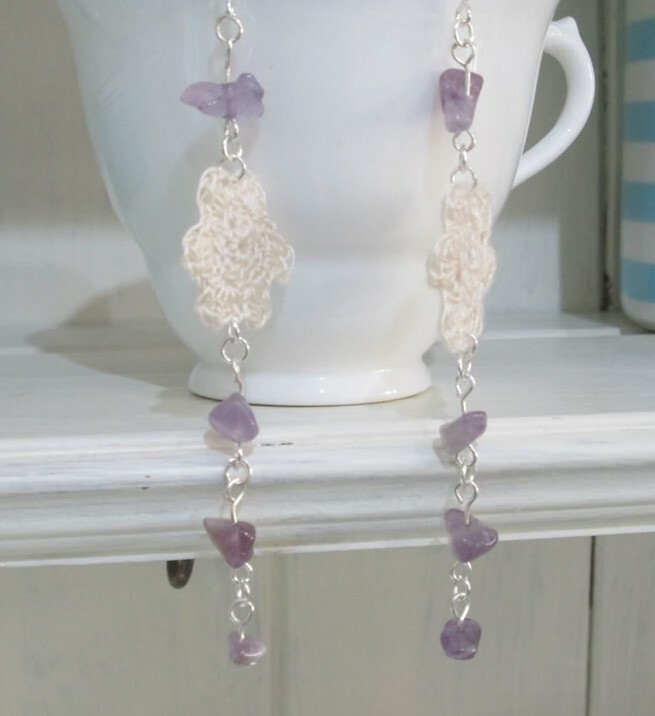 This time I have used a crocheted flower as an element of each earring. 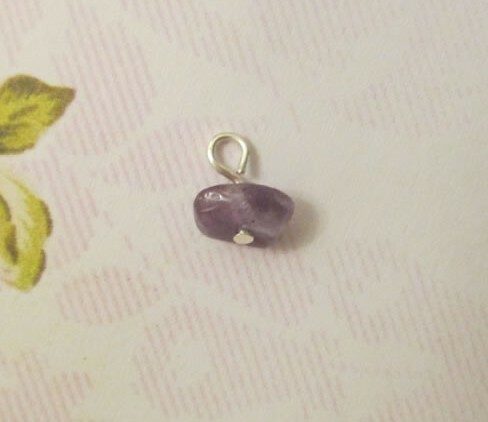 The beads are semi precious stones that used to be a rather boring necklace! I strung them together using eyepins and jump rings. The earrings came together pretty quickly and took at most a couple of hours to make. 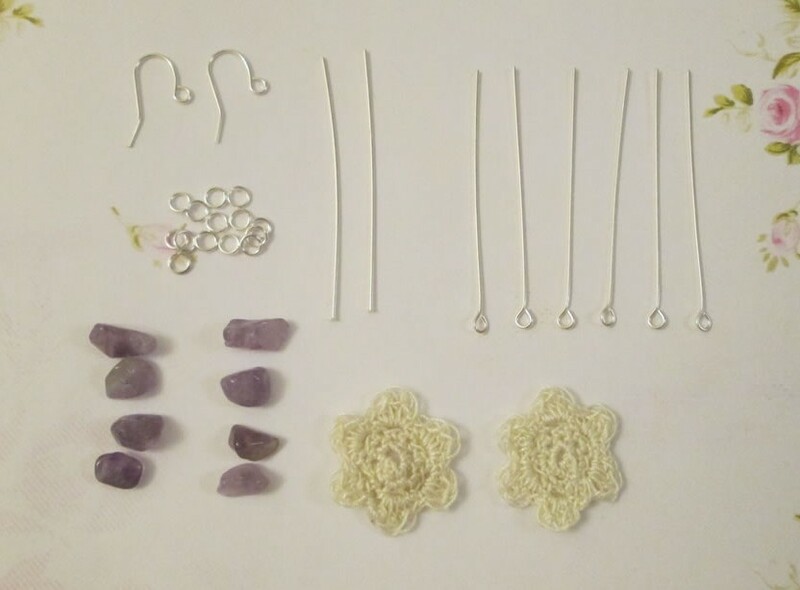 This included designing the earrings and crocheting the flowers. You Will Need: single strand embroidery thread, 2 mm crochet hook, 2 ear wires, 8 semi precious natural rough cut or chip beads, 2 head pins, 6 eye pins, 14 jump rings, round nosed pliers, flat nosed pliers, wire cutters. 1. 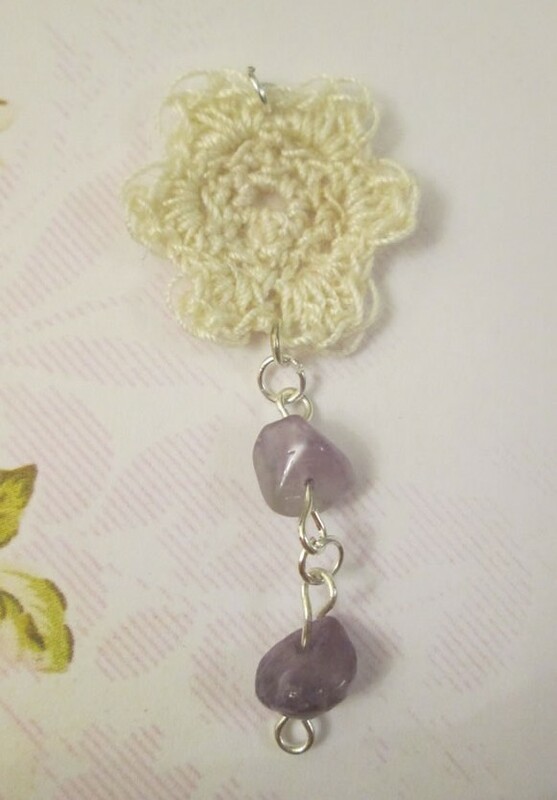 Make the flowers using the embroidery thread and the crochet hook. 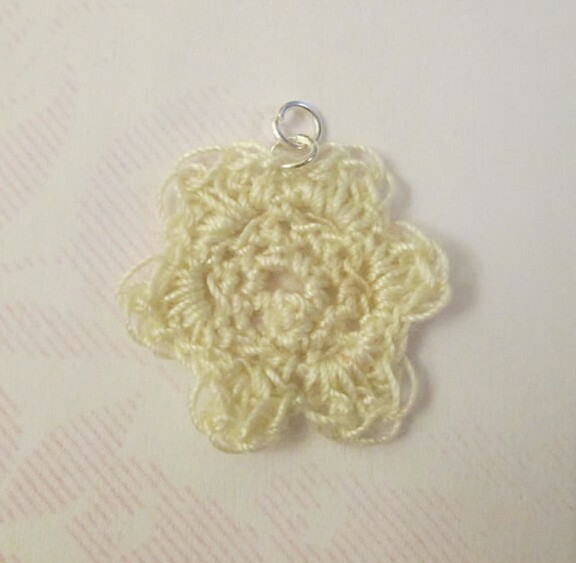 Instructions can be found here (it’s a tutorial for making a flower for a hair bobble, but the pattern is the same. 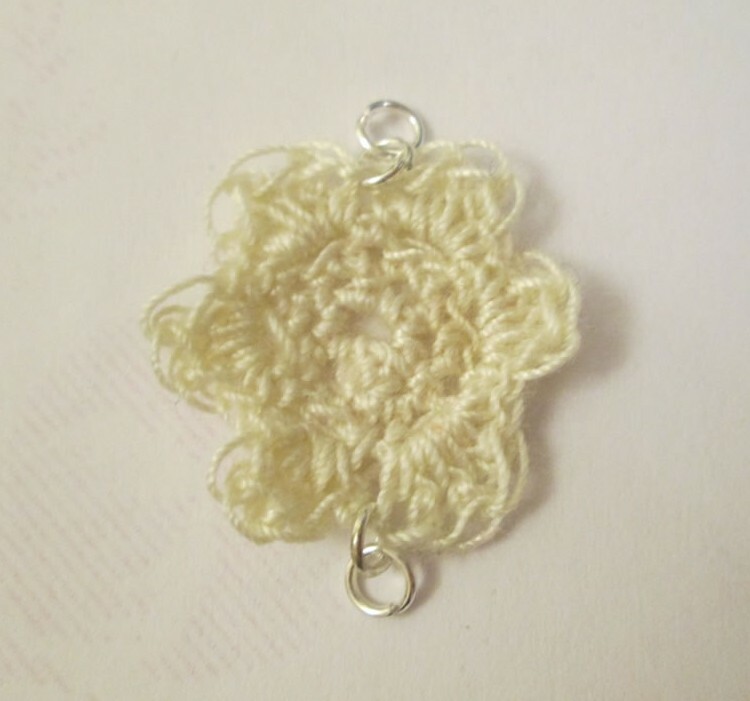 The flower turns out smaller because the thread is finer and the hook is smaller). 2. 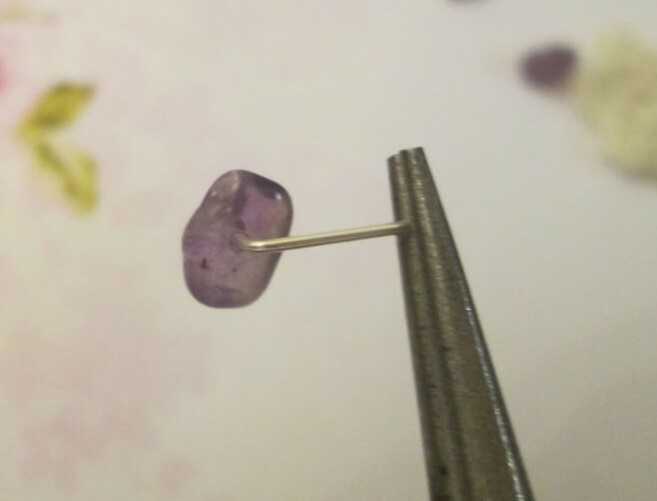 Take one of the beads and thread it onto a head pin. Make a loop. If you are new to this or it has been a while and you’ve forgotten, to make a loop, bend the end of the head pin over to make a right angle. Cut the end off so that you are left with about a cm of wire. Using the round nosed pliers and starting at the end furthest from the bead, bend the wire into a loop about half way. Adjust your hand and the pliers so that you are comfortable. Complete the loop. If the loop is not quite closed, give it a gentle squeeze with the flat nosed pliers. 3. 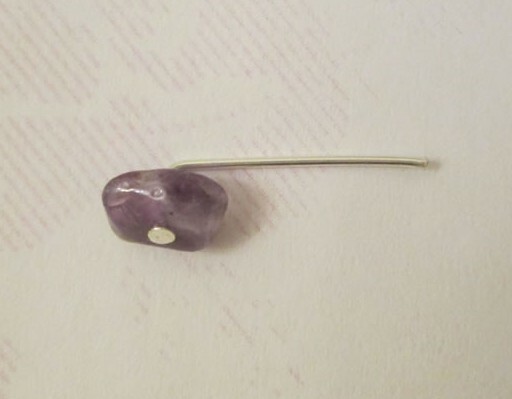 Take another bead and thread it onto an eye pin. Make the free end into a loop. Repeat for the 2 remaining beads. 4. Attach a jump ring to the top of the flower between the petals. 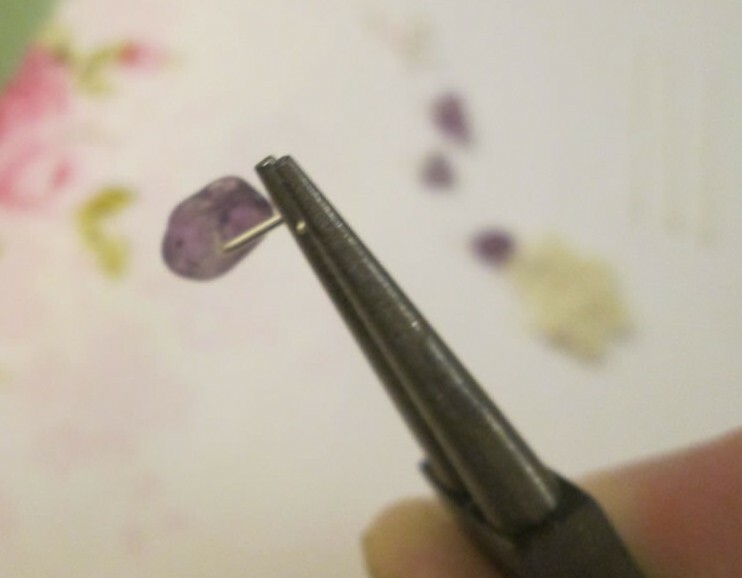 Attaching it here will hopefully prevent the flower from becoming stretched when you are wearing the earrings. Attach another jump ring to the first jump ring. 5. Attach 2 more jump rings to the bottom of the flower in the same way. 6. Using the jump rings, attach the rest of the elements together. 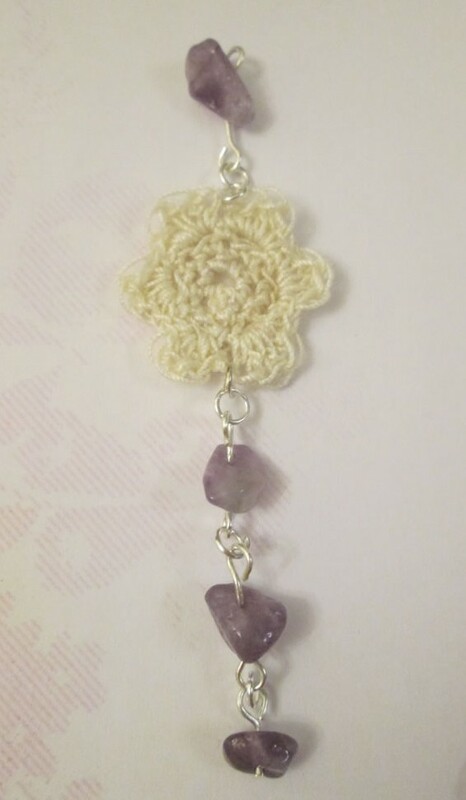 Below the flower, attach 3 beads all joined together with jump rings with the last bead being the one on a head pin. 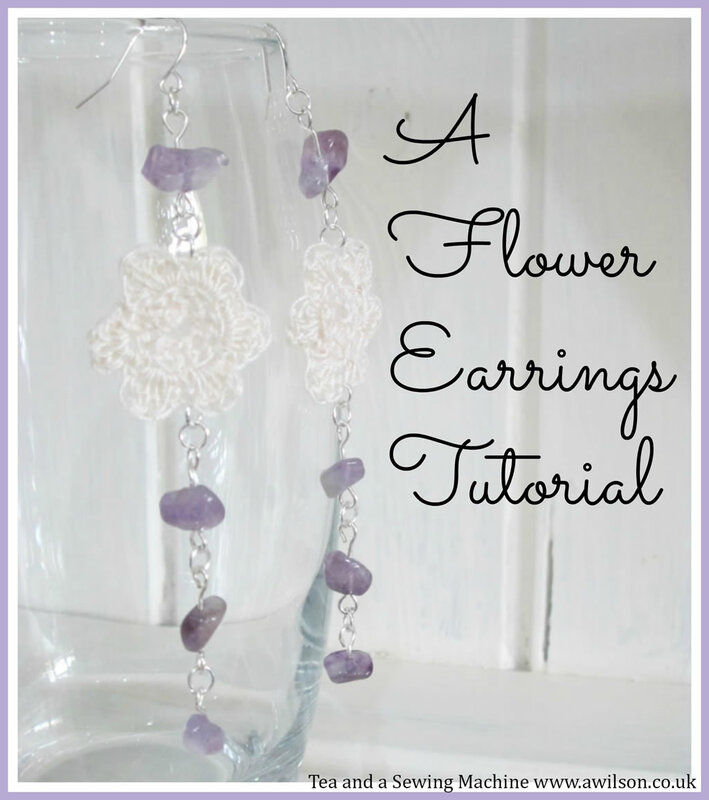 Above the flower, attach one bead and then the ear wire. 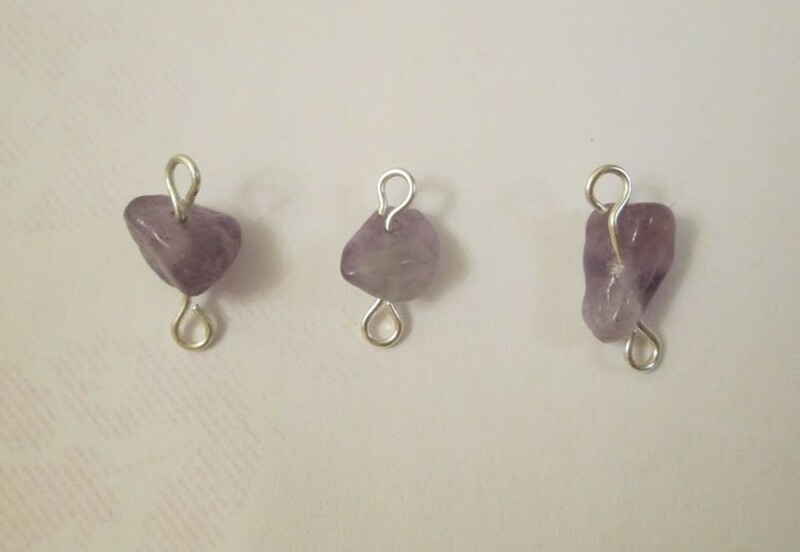 Here are the finished earrings! Lovely earrings and think adding textile touches make them so different. 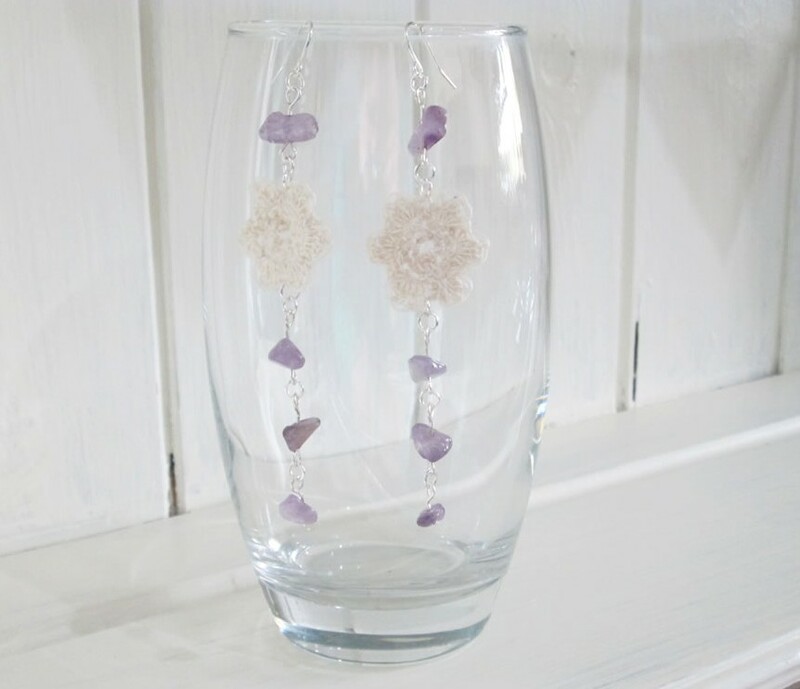 These are such lovely earrings you have created. I love the crocheted motif design. Thnaks! The flowers were a surprisingly easy way to add something a bit different. Hi! Stopping by from Submarine Sunday. These earrings are so pretty. 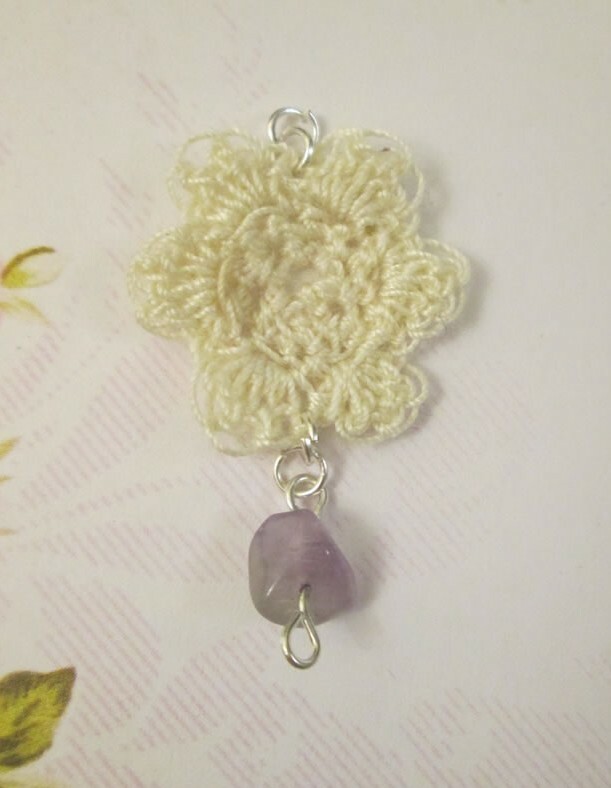 I just started learning to crochet and I recently learned how to crochet a flower. Thank you so much for sharing this! Hi, such a cute tutorial thanks for sharing it at the party. Hope to see you again soon! these are super cute! I wish I remembered how to crochet! I need to relearn..maybe take a craftsy class soon!! Thanks for sharing at TTT! Pinned and shared@ hope to see you this week with more amazing goodies! Thanks Jess 🙂 There are videos on youtube if you want to relearn crochet!